A nudge will send a reviewer an email reminding them there’s a proof waiting for them to look at. Kind of like a tap on the shoulder to say “remember my proof?”. Open the info pane by clicking on the i icon on the proof tile, or when viewing the proof. 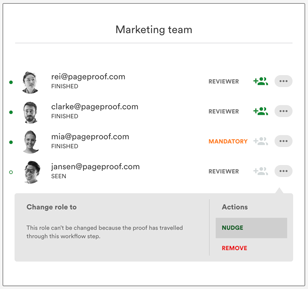 Scroll to the workflow and click the more icon next to the reviewer who has not looked, or finished with the proof. Select nudge to send an email reminder to the reviewer.